Darren’s paper “Filthie groping and uncleane handlings: an examination of touching moments in dance of court and courtship” has been published by Manchester University Press in its new volume The Senses in Early Modern England 1558-1660. 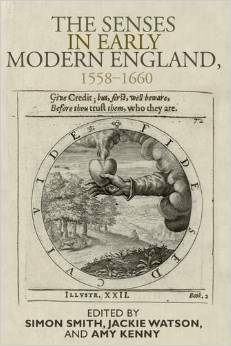 Considering a wide range of early modern texts, performances and artworks, the essays in this collection demonstrate how attention to the senses illuminates the literature, art and culture of early modern England. Examining canonical and less familiar literary works alongside early modern texts ranging from medical treatises to conduct manuals via puritan polemic and popular ballads, the collection offers a new view of the senses in early modern England. The volume offers dedicated essays on each of the five senses, each relating works of art to their cultural moments, whilst elsewhere the volume considers the senses collectively in particular cultural contexts. It also pursues the sensory experiences that early modern subjects encountered through the very acts of engaging with texts, performances and artworks. This book will appeal to scholars of early modern literature and culture, to those working in sensory studies, and to anyone interested in the art and life of early modern England. The book is available to buy from Amazon UK, Amazon Int. and Blackwells.